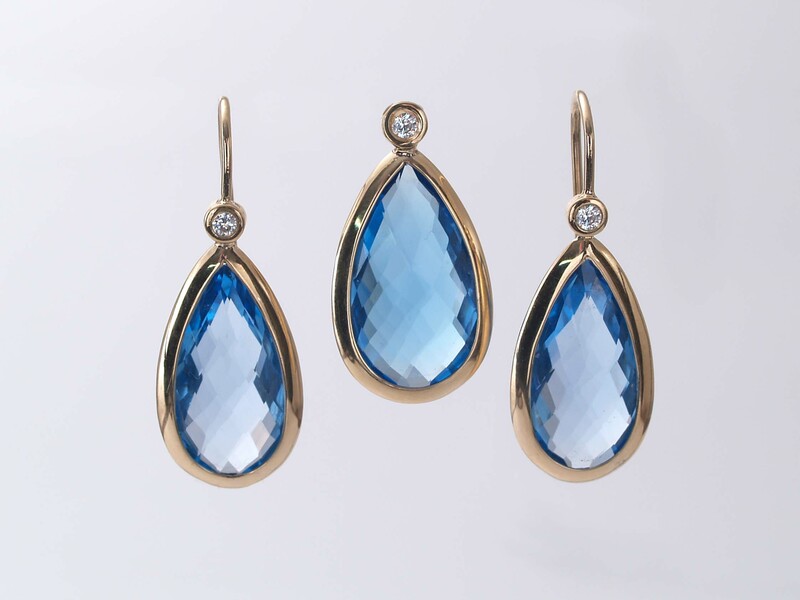 These 3 pieces of topaz came to me from a young cutter in Jaipur. They are perfectly matched and uniformly traditional ‘Swiss’ Blue Colors. I had them bezel set in 18KY gold with a diamond accent. This set of earrings and pendant is perfect for a November birthday! Easily worn, throw on with a t-shirt or cocktail dress, and this pair will make the whole outfit! The gems were custom selected by me, but know they are highly unusual cuts and should remain together. The diamonds are IJ SI2 quality bezel set and are elegant accents. Not to be missed! Chain not included. The chain slips through the hole on the top of the pendant and needs to be 1mm or less. Call us if you want me to provide a chain.